You have the option with or without Sugar Loaf tour. Pay attention to the location of the hotel you are staying at. There are pick ups in hotels in the South Zone of the city and Barra da Tijuca. They are distinct zones with different prices. If you are staying in São Conrado, Leblon, Ipanema or Copacabana, please select the option South Zone hotels. If you are staying in Barra da Tijuca, please select the option Barra hotels. Join our Small Groups tour and enjoy a great opportunity to meet two of the greatest Rio’s landmarks in the same day, on an intimate express tour. You will also get acquainted with Santa Teresa and its unique charming architecture and visit the famous Selaron Steps. A van will do the pick-up and the drop off at most hotels in Leblon, Ipanema and Copacabana. On the tour we will make most of your time by showing you 3 of Rio’s biggest attractions, leaving you with more free time to get to know many other wonders in Rio. This is an excellent option to see the best of Rio if you want limited time in the city. After hotel pick ups, the van takes you up Corcovado Mountain through the dense Tijuca rain forest to the 38m tall (125ft) Christ Redeemer Statue. The guide has between 40 and 50 minutes to show the wonderful sights of Rio. 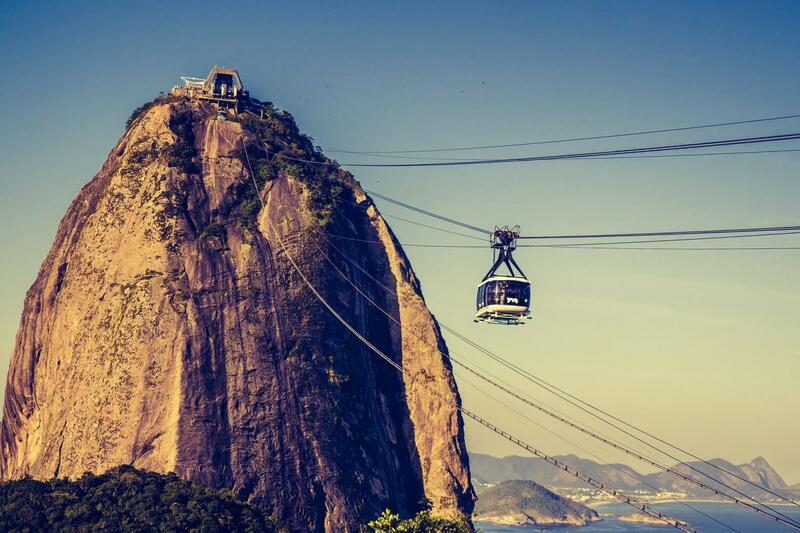 From the top, enjoy the spectacular views of Rio and the surrounding countryside. After riding the van back down, you will visit the charming Santa Teresa before arriving at Sugar Loaf. As you make your way to Sugar Loaf, you will get acquainted with Santa Teresa, a neighborhood with a complete different vibe from the rest of Rio. Here, Old Rio comes alive. Santa Teresa is a neighborhood where laid-backness and tradition meet. But it also brings you street art, such as the amazing Selaron Steps. The beautiful steps done in ceramic by artist Jorge Selarón are one of a kind. You will have about 10 minutes or so to contemplate it before continue your tour back to your hotel or continuing on to Sugar Loaf Mountain. After that, if you have selected the option you’ll travel all the way to the top of Sugar Loaf in two steps by cable car. The first cable car takes you to Urca Hill, a vantage point 215 meters high for which already grants beautiful views of Guanabara Bay and its islands, the Rio-Niterói Bridge and Corcovado Mountain. From this stage, a second cable car takes you up to the top. At 395 meters we’ll enjoy splendid views of Copacabana beach, the Santa Cruz fortress and several beaches of Niterói. Enjoy this magnificent scenerey for about 45 minutes until you have to get back down to catch the van which will bring you back to your hotel. If visiting in the afternoon, prepare yourself for the spectacular sunset from the top of Sugar Loaf. Please be mindful when selecting as we offer options with and without tickets. If you select the option without tickets, we suggest you bring the amount in cash so it can be paid directly to the guide so you can be included in our voucher, otherwise, you may have to enter the line for the purchase of tickets. The tour itself was amazing, great guide, small group size which was perfect for being on-time and not feeling rushed. Only thing that could be improved was the pick-up from the hotel. There was no sign where to meet in the lobby or outside, van used to pick us up had no logo. Otherwise no complaints, worth the money. Love Gray Line! The tour was very well organized, informative, and enjoyable. Our tour guide Siegfried was very knowledgeable and gave great details on the different places we were visiting as well as the different neighborhoods and areas we were passing by. Siegfried has a great process of inclusion and making sure everyone knows what’s going on, when they have free time, and when and where to meet up after we are exploring on our own. He was very friendly to all, spoke English, Spanish, and Portuguese fluently to those in the tour, and was a great tour guide! Mauricio was a great driver as well, very friendly and took us around the city in a comfortable atmosphere. The tour was great, and we were able to visit Christ the Redeemer statue, Sugarloaf Mountain, and Selaron Steps all in one day, which was well worth it because these are some of the top tourist spots we wanted to visit. Thanks! Alle hoogtepunten in 1 excursie, zeker de moeite waard!